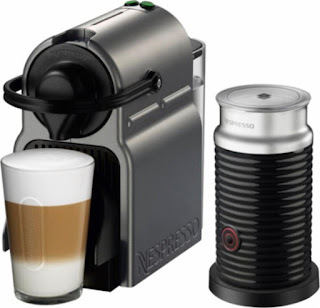 My neighbor has one of these and instead of heading to Starbucks now - I just shoot him a text and order☺ I NEED this *BEST PRICE* Nespresso - Inissia Espresso Maker / Coffeemaker / Milk Frother $99.99 (Retail $199.99). Prepare specialized coffee drinks with this Nespresso Inissia Titan bundle. It brews a cup of hot espresso in 25 seconds before shutting off automatically, and it includes the Aeroccino3 milk frothing device to top off your creations. This compact Nespresso Inissia Titan bundle produces two convenient sizes to satisfy your cravings.